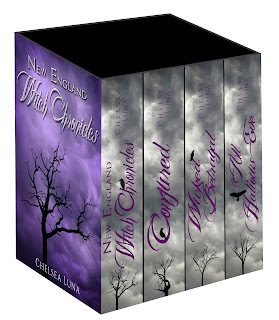 Box Set Deal - Kindle Books 1-4 of the New England Witch Chronicles series is available for $9.99! Click here! This boxed set includes all four books in Chelsea Luna’s BESTSELLING young adult series – NEW ENGLAND WITCH CHRONICLES, CONJURED, WICKED BETRAYAL and ALL HALLOWS EVE. Over 250,000 words of reading for the incredible low price of $9.99. The Salem Witch Trials of 1692 were an embarrassing stain on America’s revered past. Innocent people were persecuted at the hands of a few overzealous Puritans, but what if real witches existed during those colonial hunts? What if there are witches in present day New England? That’s what Alexandria Ramsey’s crazy grandmother believes. Grandma Claudia claims Alex descends from a long line of New England witches. After the disastrous fallout on Halloween and the tragic events that followed in the Hazel Cove Cemetery, Alexandria is left picking up the pieces of her broken life. Peter is adjusting. James hates her. Grandma Claudia is gone. Emma is incoherent. Victor went rogue. And Gamma still wants her dead. If that wasn’t enough to deal with, two burning questions are driving Alex insane. Who committed that horrible murder in Salem? And what really happened to Ethan? Alex has come to terms with her new life, but she’s yet to truly understand the ramifications of being a pureblooded witch in the supernatural world. And now there is a new danger on the horizon. Alex must find a way to fight. To survive. To protect her remaining family members and her closest friends from an unthinkable new enemy. One much more powerful and much more horrifying than the Gamma witch hunting fraternity. The clock is ticking. Alex’s time is running out. Spring has hit Hazel Cove and with it, the pressure of Alex’s impending fate as Liam’s sacrifice is weighing upon her every thought. There’s so much to do and so little time. How do you stop an ancient pure blooded witch? But Liam isn’t Alex’s only problem. She must focus on what she can fix in the little time she has left. She must confront the past and the horrible betrayal Ethan suffered at the hands of a once trusted ally. Alex will do anything necessary to save Ethan. Even brave a trip to the supernatural capital of the world - New Orleans. Voodoo, Hoodoo, witches and spirits are nothing compared to the evil Alex will face in the backwoods of the Louisiana bayou. Will Alex’s desperation to save her family and friends pull her closer to the darkness? Who can Alex trust? Will James’ connections as a witch hunter help or hurt her? Can she fix her relationship with Peter? Or will the deep seeds of betrayal shatter Alex’s life? All Hallows Eve is the gripping conclusion to the New England Witch Chronicles Series. Well thanks for sharing the awesome news and it would be great to have them at this amazing price. I am planning to buy one and present it to my friend for his birthday.